Ohio sophomore Nathan Rourke breaks away from a pair of RedHawks, in front of OU senior Troy Mangen (82), during a first half touchdown run on Tuesday in Athens, Ohio. 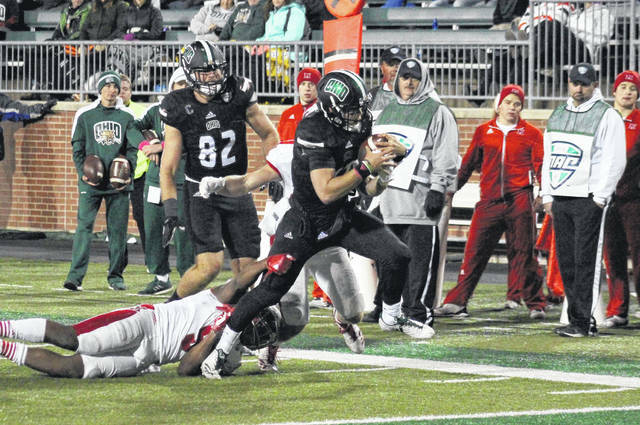 Ohio senior Branden Cope hauls in a touchdown pass in front of Miami’s Heath Harding, during the Bobcats’ victory on Tuesday in Athens, Ohio. ATHENS, Ohio — No ghosts or goblins, just Nathan Rourke putting a fright in RedHawks this Halloween. 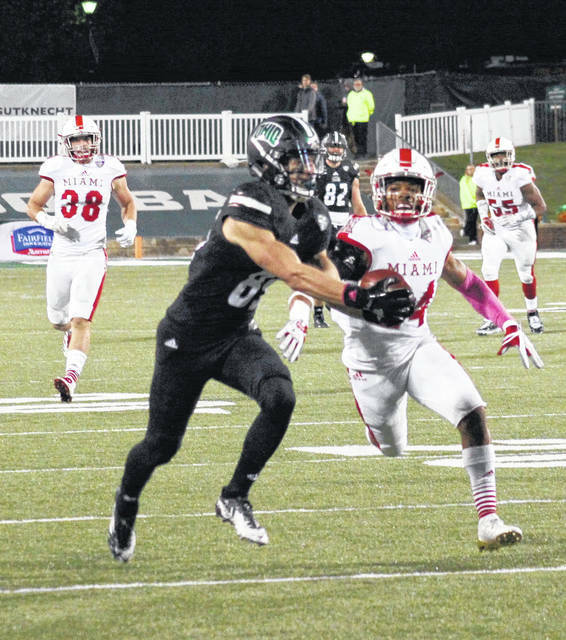 Rourke, Ohio’s sophomore quarterback, threw for three touchdowns and rushed for three more on Tuesday night in the the 94th ‘Battle of the Bricks’, as the Bobcats claimed a 45-28 victory over archrival Miami in Mid-American Conference action at Peden Stadium. Ohio (7-2, 4-1 MAC) marched 75 yards in nine plays on the game’s opening drive, with Rourke capping off the possession with a three-yard touchdown run. Zervos made the point-after kick, his first of six straight, to give the hosts a 7-0 lead. The RedHawks (3-6, 2-3) made it into OU territory on their first drive, but Ohio sophomore safety Javon Hagan intercepted a pass at the Bobcat 21. After a 39-yard pass from Rourke to Troy Mangen on the first play of the possession, Ohio covered the remaining 40 yards on the next play, as Rourke found Brendan Cope for a touchdown. Miami scored on the ensuing drive, covering 77 yards in seven plays, with Billy Bahl finding James Gardner for a 14-yard scoring pass. Sam Sloman made his first of four successful point-after kicks, cutting the Bobcat lead to 14-7 with 4:11 left in the first quarter. Following a three-and-out by the hosts, Miami went 54 yards in four plays and Alonzo Smith tied the game on a 16-yard run with 1:02 left in the first. The Bobcats were forced to punt less than a minute into the second period, but Jalen Fox intercepted a Miami pass and returned it all the way to the MU four-yard line. After being backed up three yards on first down, Rourke kept the ball on an option sweep, rushing seven-yards for the touchdown with 11:57 left in the half. The Bobcats extended their lead back to 14 points with 2:13 left in the second quarter, as Rouke tossed a 14-yard touchdown to Papi White, capping off an 11-play, 83-yard drive. Miami was left with just enough time to answer back and the RedHawks cut their deficit to 28-21 with 17 seconds left in the first half, when Bahl and Gardner connected for a four-yard touchdown pass. After a quartet of punts to start the second half, the RedHawks tied the game at 28, as Bahl found Gardner for a 25-yard scoring pass with 3:15 left in the third quarter. The game didn’t stay tied for long, as Ohio answered with a six-play, 65-yard drive, that was capped off by an 11-yard scoring pass from Rourke to Jerri Marhefka. Next, the Bobcat defense forced a three-and-out, with Miami punting on the third play of the fourth quarter. Ohio stretched its lead to 14 points for the third time with 10:42 left in the game, as Rourke punched in from the one-yard line, capping off a seven-play 69-yard drive. The hosts put the cherry on top of the 45-28 victory with 6:48 remaining, as Zervos made a 36-yard field goal. 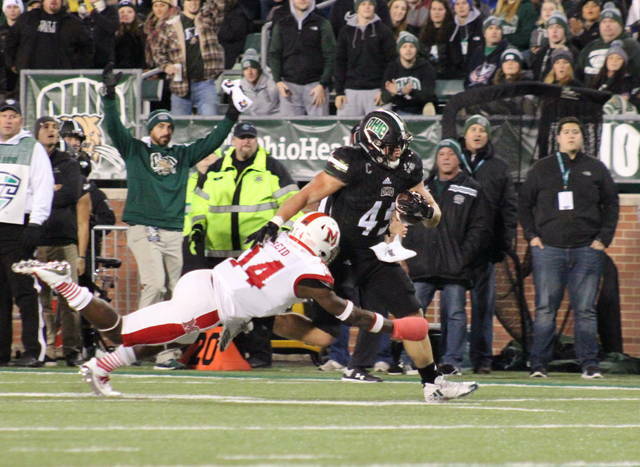 “Proud of our kids, that we played hard the entire game,” said Ohio head coach Frank Solich. “We didn’t have a turnover, which was important. That’s one thing that we talked a lot about going into this game. We got off to a fast start, that’s another thing that we talked about, trying to play the four quarters and not have it be a slow start for us. For the game, Ohio earned a 26-to-21 advantage in first downs. Miami claimed a 448-to-443 edge in total offense, but the Bobcats held a 149-to-98 advantage on the ground. Both teams converted on four third down tries, with OU attempting 13 and Miami trying 14. MU was 0-3 on fourth down tries, with the Bobcats not attempting a fourth down conversion. 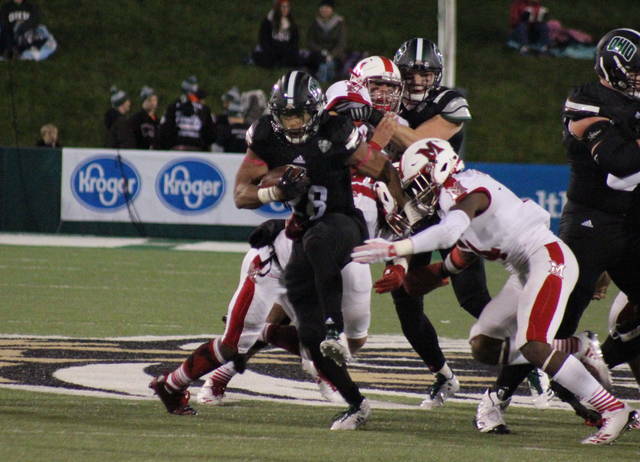 Ohio punted seven times, twice more than the RedHawks, but Ohio won the turnover battle by a 2-0 count. The Bobcats were penalized six times for a total of 50 yards, while the guests were flagged 10 times and sent back 95 yards. Rourke — who was never sacked in the game — was 21-of-33 passing for career-high 294 yards, while rushing 10 times for 54 yards. A.J. Ouellette led the Green and White on the ground with 80 yards on 20 carries, while Dorian Brown added 15 yards on six carries. Cope and White each hauled in five passes in the win, earning 89 and 80 yards respectively. Andrew Meyer caught four passes for 49 yards, Mangen had 49 yards on three grabs, while Marhefka picked up 27 yards on three grabs. The Bobcat defense was led by Quentin Poling with 10 tackles, including four solo and 1.5 for a loss. With his quartet of solo tackles, Poling moved into the top-spot in the programs’ record book with 207 career solo tackles. Chad Moore had nine tackles for the hosts, Hagan added seven, while Bradd Ellis and Kylan Nelson each came up with six. Andrew Payne had the game’s lone sack. Bahl finished with 350 yards on 28-of-51 passing for the RedHawks. Smith led the team with 81 yards on 10 carries, while Gardner earned game-highs of 10 receptions and 166 yards. The Bobcats have now defeated Miami in five straight meetings, but MU still leads the all-time series by a 52-40-2 count. Ohio will be home for the final time this season on Nov. 8 against Toledo.